TransDerma Mineral products are energetically enhanced in a Laminar Crystal energy chamber using a proprietary and unique process. The crystal structure in liquids is changed, lowering its surface tension and increasing its oxidation reduction potential (ORP). Energetically enhanced minerals become highly absorbable. Restore healthy mineral balances, cellular electrolytes, & significantly improve your overall health. Packaged in BPA free plastic containers. Using a proprietary process (manufactured and sold only by us), we energetically enhance the fluids in a Laminar Crystal energy chamber, changing the liquid crystal structure, lowering its surface tension and increasing its oxydation reduction potential. Energetically enhanced minerals become highly absorbable, directly through your skin. They will restore healthy mineral balances, cellular electrolytes, and significantly improve your overall health. Using transdermal delivery (through the skin), you absorb much more of the minerals than otherwise expected. Every time you get excited, you need magnesium to calm down and relax. The lower your magnesium level, the lower your threshold for new stress. Thus, you become increasingly more sensitive to stress: more adrenaline, greater magnesium loss, greater sensitivity, etc. Soon your intracellular magnesium level is no longer 10 times that of serum, and your cells are in a chronic state of hyperexcitability. Anxiety, irritability, anger, depression and mood swings are just the tip of the iceberg of magnesium deficiency symptoms. by C. Norman Shealy, M.D., Ph.D.
Say "Good-bye" to Pain!! - (Magnesium Oil) is a very unique and powerful form of magnesium that is almost immediately assimilated by the body, through the skin, directly to the cellular level. By using it either topically or in a soak, massive amounts of magnesium can be absorbed by our bodies. Body pain is usually eliminated immediately. It can be used by the body to address the many areas magnesium deficiency. Application of (12 oz of Magnesium Oil) either topically or in a soak, will deliver more usable magnesium at the cellular level than could be delivered in five years through oral supplementation. It is well known that oral supplementation of magnesium in any significant quantities will cause massive and prolonged diarrhea and is very likely to cause serious kidney damage. These side effects are completely avoided when using Magnesium Oil even with very large quantities and high frequency. 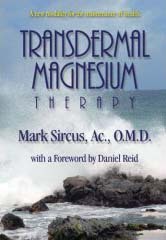 In this book, Dr. Shealy has documented almost ninety health issues that are directly related to magnesium deficiency. Dr. Shealy also draws a strong correlation between tissue magnesium levels and DHEA levels. He has also determined that when the body is presented with adequate levels of magnesium at the cellular level, the body will begin to naturally produce DHEA and especially the more important DHEA-S. Since DHEA is the primary bio-marker for aging, the long range effect of large doses of magnesium in a usable form is to significantly raise DHEA levels and thus produce true Age Reversal results. Dr. Shealy refers to DHEA as the Master Hormone which when produced at sufficient levels will induce the production of all of the other hormones whose depletion can be associated with many symptoms of aging. Through the use of Magnesium Oil, women have reported complete abatement of menopausal symptoms and some have even returned to their menstrual cycle. Dr. Shealy has stated that once anyone commences regular use of the Magnesium Oil, the aging process has stopped and true age reversal has begun. Since we have stopped aging, time is not longer working against us. We will all eventually regain the optimum level of DHEA we had at about age 23. It logically follows that when our DHEA levels are what they were 10, 15 or 20 years ago, we will also feel like we did 10, 15, or 20 years ago and many aging symptoms that crept into our lives during the last 10, to 20 years will disappear. Bathing in water enriched with magnesium chloride is very soothing - it is the mineral that is the component of sea water, and is also present in the amniotic fluid. When vital magnesium is delivered in a skin penetrating energetically enhanced medium - Living Water - it goes directly to your cells where it can be utilized with maximum efficiency. Vital magnesium is the cause of truly magical things that begin to happen. Reversal of many aging symptoms is common - some people report they have grown back deteriorated bone, cartilage, and even enamel on their teeth. Teeth brushed with the Magnesium Oil daily will develop a pearly translucence. What is exciting about this form of magnesium is that it is easily absorbed into the body through the skin and is delivered directly to the cellular level, thereby completely bypassing the body's natural rejection of magnesium as is so often experienced with oral supplementation. There are no reactions of nausea or diarrhea, and yet, the magnesium levels in the body can be significantly increased in this manner. Magnesium Oil can be used in a foot or hand bath (preferably used by soaking the whole body in a tub). In 15 to 20 minutes your magnesium deficient body will extract all of the available magnesium.